It has been pretty hectic in the gaming world lately. Several games have either released or have been running beta testing. 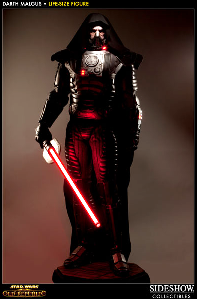 Star Wars: The Old Republic is no exception. Beginning today, Thursday, May 17th at 12am CDT and lasting till Monday, May 21st at 2am CDT Bioware is having a Weekend Pass to try the game. This time around players can play through till level 15. That means you will be able to see the starting planets as well as each faction’s capital planet. Bioware is also saving any characters you create to the account you use, so if you decide to purchase a subscription you won’t have to start over. For more information be sure to check out the official news article. Nothing beats free gaming! Amber Green and Joveth Gonzalez have posted this week about a few bugs spotted by the community that the Devs are working to fix. One is about a search issue with the Galactic Trade Network, another one deals with the Imperial Agent storyline quest – Star Chamber, and the other post talks about the issue of the companion, Ashara and how certain head pieces are causing her head to disappear…that would be a bit unnerving in cut-scenes let alone running around the fleet with the headless companion. For more information be sure to check the links and also take time to read the forum. Oh and if you see a bug, report it. We can help improve the game by letting the development team know of an issue. This week the podcast was hosted by Carla and Maer. They talked about new things coming in Patch 1.3 and they also discussed their thoughts on whether or not every patch should go to the Public Test Servers or not. Deirdre was with her family after the loss of her grandfather. We extend our thoughts and prayers to her and her entire family during this time. Our community might disagree on things about the game, but it is nice to know how we all tend to pull together and support each in times of need and sorrow. Many of you know Dulfy and her site dulfy.net. She has teamed up with Zoopercat from askmrrobot.com to start a whole new site. The site is called TOR-Fashion. It is going to be the place to check out how various orange Moddable armors looks like before buying or setting out to work Flashpoint etc for drops. 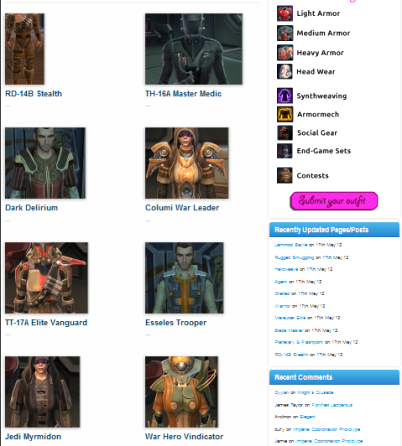 They already have many images of several armor sets for Empire and Republic alike. The site will display any of these known Moddable orange armors sets that they can find. The creators of the site are also asking for people to submit your screenshots of your orange armor sets to add to the site’s fashion portfolio. I believe this site will be very popular, especially after Patch 1.3 hits and all the light social armors can also be medium and heavy. Be sure you head over there and checkout all the many different armor sets already posted. This week I’m changing it up a bit, instead of a music video I have come across a video on Youtube, thanks to Chris from The Sarlacc Pit podcast and the link, about a project to save a certain farm from a galaxy far, far away. I am referring to the Owen Lars farm from the original Star Wars movie. The farm location is in the country of Tunisia. In the short clip you can see how badly the farm is looking after years of neglect. Now to the “normal” person on the street they would shake their head in disbelief at the thought of people trying to restore a movie location in the middle of a desert, but to the real believers and dreamers (like me and hopefully you too)…this is something worth saving if only to glimpse at just one sun setting low on the horizon at sunset and dreaming of far off adventures in that galaxy far, far away. If you would like to help the project through a donation, you can visit the official save the Lars Homestead site and read more of the complete details of the project and how it all got started. You can also follow the project as it goes forward on their Facebook page. That is it for this week’s HoloNet Links. 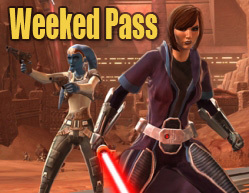 Is there a particular link, story, video, or topic related to SWTOR you would like us to highlight? Maybe you or someone you know deserves to be highlighted in our SWTOR Community Spotlight if so please email us at corellianrun@gmail.com or you can leave your links and suggestions in the comments below, or in the Facebook group. See you all next week. Now if Bioware can just get a “barbershop,” so you change your character looks now and then.